I agree with my friend when he said that this has got to be one of the best Kadayawan celebrations ever. 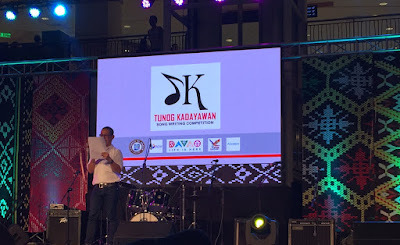 Indeed, the 32nd Kadayawan Festival in Davao City is both memorable and eventful. As part of this year's official social media team~~Davao Digital Influencers, I was a witness how local (both private and government) groups and individuals pooled their precious time, efforts and dedication to make it a ravishing success. With Martial Law currently in effect in the whole of Mindanao, we Davaoenos barely felt it but admittedly, businesses in the tourism industry are somehow affected. And Kadayawan is the perfect way to prove that Davao is still standing strong as a livable and progressive city. Well, I also believe in the fact that the President of the Philippines Rodrigo Duterte having his home base here (where he was mayor for 20 years) helped a lot in promoting Davao to the Philippines and the world. I can say that the Davao City government and the organizing committee did a very good job planning and executing the event's programs/activities. Likewise, my gratitude goes to the government for implementing strict security measures to keep everyone safe as they enjoy the revelry of the Kadayawan week. It was like Davao city was having a huge fiesta.There were so many activities showcasing our talents, culture, artistry in dance, music and the arts. There were also tribal games and the Dragon Boat competition. One of the many important highlights this year is the Kadayawan Village where native houses were built to present the eleven (11) indigenous tribes of Davao. New competitions were also introduced such as the Tunog Kadayawan (songwriting competition) and Mugna Kadayawan (doodle art competition). Of course, this yearly celebration would not be complete without the much-awaited pageant Hiyas sa Kadayanwan, and the street competitions such as Indak-indak sa Kadalanan (street dancing) and Pamulak sa Kadayawan (floral float parade). There was also Pitik sa Kadayawan (drum-beating competition) which was done for the first time to go with the floral parade giving it a lively vibe. It was a busy yet enjoyable and unforgettable week not only for the Davaoenos but also for the visiting tourists who've grown to love the city the moment they set foot on it. Looking forward to another vibrant Kadayawan next year! I love Davao, life is definitely here and I am proud to be a Davaoeno.